Anti aging wrinkle treatments with superior firming and face lifting ingredients have made their way into the drugstore. Top dollar for Revitol or $20 bucks for Loreal? Let's compare! Collagen creams have been around for quite some time, yet recently I’ve seen them advertised as topical wrinkle fillers. The idea that collagen applied to your skin topically can work a miracle is somewhat of a myth and a misconception. Seriously, a topical cream can only do so much for your wrinkles since it just sits on top of your skin and doesn’t really penetrate it too deeply. That being said, if the collagen can hold moisture then a collagen cream can make a pretty decent moisturizer. But moisture is the bottom line. You want a skin cream that absolutely agrees with your skin and helps it stay soft and smooth. Since women have different skin types each woman must try different creams with different ingredients to find one that suits her skin type and makes her skin soft and smooth. If the cream that works best for you has collagen in it, then collagen cream is fine. Collagen is an elastic, fibrous form of protein that is found in the tissue of your cartilage and ligaments. Since women over forty lose skin elasticity (and up to thirty percent of their natural collegen) they get saggy skin and wrinkles. So the collagen creams are marketed to slow the process. You will see collage in night creams, eye creams, and anti wrinkle face creams. I think a collagen molecule can’t even penetrate your skin. So the actual ingredient you’ll see in many of the creams is a keratin protein combination which tries to help your body build collagen. I don’t know that collagen per se is a miracle ingredient, it is more about whether the collagen cream increases the moisture to your skin making it suppler and feel firmer. Some women fall in love with collagen creams and swear by them. The gelatin-like aspect of the collagen cream makes it feel and even look as though skin is firmer and smoother. Just know that the actual collagen or even keratin content of such creams is such a small ingredient that the potential for a true skin miracle is rather remote. A topical cream is not going to be able to penetrate deeply into the skin. Not only that, you are washing the cream off in the evening and it is going down the sink so to speak. But a cream that is thicker in consistency and adheres to the skin nicely making it softer all day is definitely beneficial. Dry cracked skin can in my opinion contribute to wrinkles. Creams that irritate or cause break outs don’t do you any good either. Skin is best when it is kept soft and smooth. L’Oreal came out with a discounted line of collagen creams that are formulated to decrease and fill in wrinkles with the collagen ingredients. I’ve looked over many reviews of the various creams for eyes and face and the L’Oreal collagen cream product line gets an average consumer rating of about three and a half stars out of five. While the true effectiveness of such creams is debatable, they do really try to inject useful ingredients into the product. As long as it does not irritate, it can’t really hurt. The L’Oreal label says that the products contain collagen bio-spheres which are supposed to expand when they come into contact with the skin. This is supposed to plump and fill up facial lines and wrinkles after it is applied. The cream definitely has some interesting ingredients including shark liver oil to rejuvenate skin, vitamin e to soothe and protect, padina pavonica extract to boost collagen levels and the collagen biospheres to increase collagen by penetrating the epidermis of the skin slightly. While the longer term usefulness of this product is questionable, some women do like it. The most important factor would be if the ingredients are agreeable to the skin because some of these ingredients could irritate women with sensitive skin. 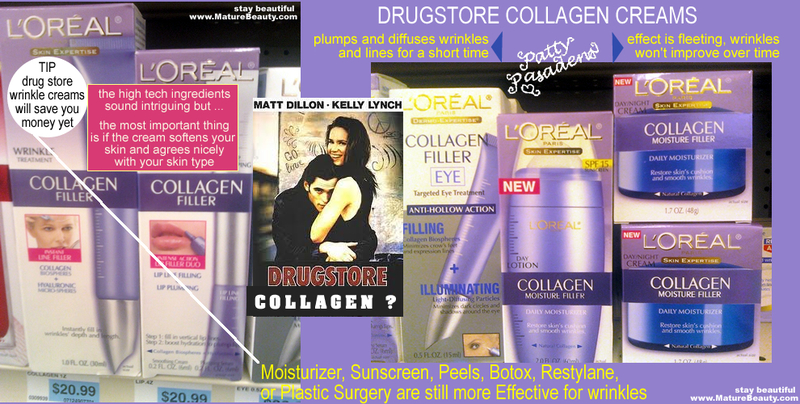 What strikes me about the L’Oreal collagen cream line is that the skin care giant has utilized some of the same ingredients you’ll see in the high end creams, and put them into lower priced drugstore creams. This gives women a cost cutting alternative if they want to spend money on wrinkle reducing and wrinkle plumping creams. Another phenomenon is that the wrinkle creams are starting to adopt some of the same ingredients that you’ll find in the specialty stretch mark and cellulite creams. You might have heard of the brand name Revitol. Revitol manufactures a very expensive, high end line of creams for stretch marks and cellulite. Stretch mark prevention creams really try to strengthen the skin, improve elasticity and rejuvenate cell growth production. Their creams also contain micro emulsion formulations that try to penetrate the skin, hydrate it and tone it. More and more, facial collagen, anti wrinkle creams are starting to look like stretch mark and cellulite creams to me. Every cream has different ingredients and formulations, so you’ll have to read reviews and do a little experimenting. The collagen creams add gelatin like ingredients to the mix, which are meant to plump, firm and stimulate the skin, along with containing the tried and true moisturizing ingredients such as vitamin E.
There are creams that cause the skin to peel, such as Retin-A. While these retinoids cause irritation, they can help somewhat because they cause the top layer of skin to flake off spurring new fresh skin to come in. Since such creams are extremely drying, it is always good to counteract any retinoid with a soft moisturizer. Similarly, chemical peels and laser treatments get rid of the top skin layers, spurring new collagen production. The collagen creams aren’t really working like a retinoid however. Collagen creams are more meant to plump the skin up making it look fuller, not peel it like glycolic creams. Collagen fillers (as opposed to creams) fill the skin from the inside via injections. Internal injection plumps out the skin way more effectively than any topically applied cream. But even using collagen as skin fill has become rather passé. The collagen injections required skin patch tests and in recent years the newer brand of fillers such as Restylane and Juvederm have over taken collagen as dermal fillers. The problem with dermal fillers is that they have to be repeated. If you use dermal fillers such as collagen extensively, I just wonder if it actually stretches out the skin even more from the inside. When you stop using the fillers (say you go broke) you may end up with skin that sags more than ever. Eventually a woman’s skin might sag so much that no cream, injection, laser or chemical peel can treat it. In that case the only alternative is to accept aging gracefully or go pay the price for plastic surgery. Obviously plastic surgery is going to be the most effective for sagging dropping winkles because skin is literally chopped away, muscles underneath can be tightened, and then sutured back up. A fifty year old woman spending a fortune on skin creams over the course of a decade might be better off buying generic body butter and banking her wrinkle cream savings to save up for a cosmetic surgery procedure. The number one thing that a woman should look for in a cream is moisturizing properties, that the cream stays on the skin without suffocating it, that it is non-irritating, and that it 100% agrees with her skin type keeping her skin soft, supple and smooth. Some of these collagen creams and creams with other high tech ingredients are specially formulated for facial skin. If you can’t afford the top of the line creams like Revitol, then definitely give some of these less expensive drug store alternatives a try. Once you find something affordable that you love, if it has collagen or other magic anti-aging ingredients or not, stick with it.